In order to move this country forward, to actually solve problems and make people’s lives better, we need a well-functioning government. We need our civic institutions to work. We need cooperation among people of different political persuasions. And to make that work, we have to restore our faith in democracy. You have to bring people together, not tear them apart. We need majorities in Congress and state legislatures who are serious about governing and want to bring about real change and improvements in people’s lives. The problem in any democracy is not in calling on people to co-operate. The problem is to decide what areas there are of broad agreement and to focus on those. The outstanding bipartisan issue of our times is energy security. At the state and local level, there’s a remarkable amount of bipartisan support for action on energy security — expressed in the everyday language of projects. What this country — and every country — needs is a bigger vision so that the friends of energy security are not divided by their differences on technology or feedstock but are united toward a common purpose that provides opportunity — and sustainable energy — for all. That platform is simple and you can sum it up in three words, gas, biofuels and electrics. Not everyone that loves electrics loves everything about biofuels and natural gas, and not everyone in biofuels loves everything about electrics and natural gas. And I think we all know by now that those who run the global oil & gas industry don’t love everything about biofuels and electrics. But in this triad of technologies there is the promise of significant emissions reduction, a sustainable basis of energy rfor a very long time, and the opportunity for projects that bring economic benefits to many and much-needed energy for all. This country ought to transition from petroleum and to a mix of gas, biofuels and electrics by 2100. A 50 percent transition by 2050. That’s 32 years from now — one generation. Demographers call this Generation Z — born after 2001 and now studying in pre-K through university right now — as if they were asleep, or some demographic subset Gen X, and nothing more. Actually, they are Generation E.
Today they are students, tomorrow workers and eventually the leaders who will take us from a dependence on petroleum to a new platform which provides sustainable energy for all. Those of us who are older have the responsibility to prepare the way for their work, teach, exhort, inspire and unequivocally support. They’ll be the greatest generation, one day. We will not know for some time what combination of technologies, in what proportions, will provide the pathway to the goal we set ourselves. But the Second World War and the Moon landings were not accomplished by the exclusive use of techniques that were known when the country commenced the journey to victory. We learn along the way. But e need a goal that unites us rather than divides us — and this is that goal. Today is 9/11 — known as Patriots Day in the United States — but the citizens of many nations perished on 9/11, many more offered support in the days following. and after all, it was the World Trade Venter that was attacked — not the United States Trade Center. 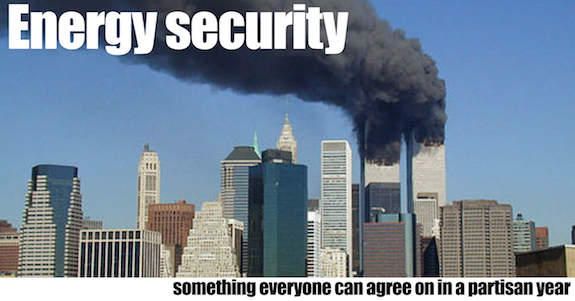 9/11 united the world, if only briefly, and we are all beneficiaries of energy security. For no one is truly secure until there is sustainable energy for all. It is worth remembering that the United States led the world in energy exports in 1941, and it was an oil embargo by the West upon Japan that led to the outbreak of the Second World War. Independence is not security, as the patriots of 1776 learned in the hard years of the War of Independence. It is not enough for one entity to become independent; a new world order had to be borne of the Treaty of Paris in 1783 to make the United States a living reality. It is not enough fo have enough; our neighbor must have enough, too — else we have seen, time and again: a shortfall felt by the few eventually becomes a heartache shared by the many. The good news is that the people already know this. 45 years of oil embargoes, wild price fluctuations, and Middle Eastern wars have convinced them that the blessings of energy security are worth the effort. It makes no differences whether those blessings mean to some a response to climate change, an economic opportunity, or simply a respite from national security fears — and we would be right to set aside our differences in those respects and get on with the job. Different groups had different hopes for what the blessings of victory in the Second World would mean. But the country united in the drive towards victory and focused on common ground rather than the issues that divide us. What makes a people bi-partisan? Not politicians that reach across the aisles, but issues that reach across the spectrum. There aren’t many of them, and we might grasp and foster them where we can, if we wish to have a more civilized political discourse. And the way to get an issue into political discourse is to discourse about it — speak truth to power. Representatives listen, especially when there are issues of such broad appeal that they become general interests and not special interests. Why not one solution, why three? Why not natural gas, alone? Why not electrics, alone? Why not biofuels, alone? Aside from the technical challenges, consider the problem of simply replacing a dependency on one technology — petroleum — for a dependency upon another. Choice is the essence of a market economy and diversification is the bulwark of sound investment. But we need to move from “All of the Above” in a drive for energy security and towards “most of the above” — just as we have moved from “all of the above” financial investment strategies in which we put money into absolutely everything, absolutely anything that comes along. So, why not set ourselves a tough but achievable goal here on 9/11 — so that those who gave their lives will not have died in vain. Three giant platforms — sustainable, available, reliable, affordable — that can power our economy to new heights in the years to come, and secure us from the terrors that have bedeviled us.